Ok, so I was supposed to sing in this concert. I was going to rehearsals and learning the music and everything. Anyway, as I can’t be in two places at once, I had to drop out of this concert. So, I’m going to advertise it because the people involved are awesome and the music is great. Especially the piece by James Woodman, he’s an outstanding composer and a really nice guy. 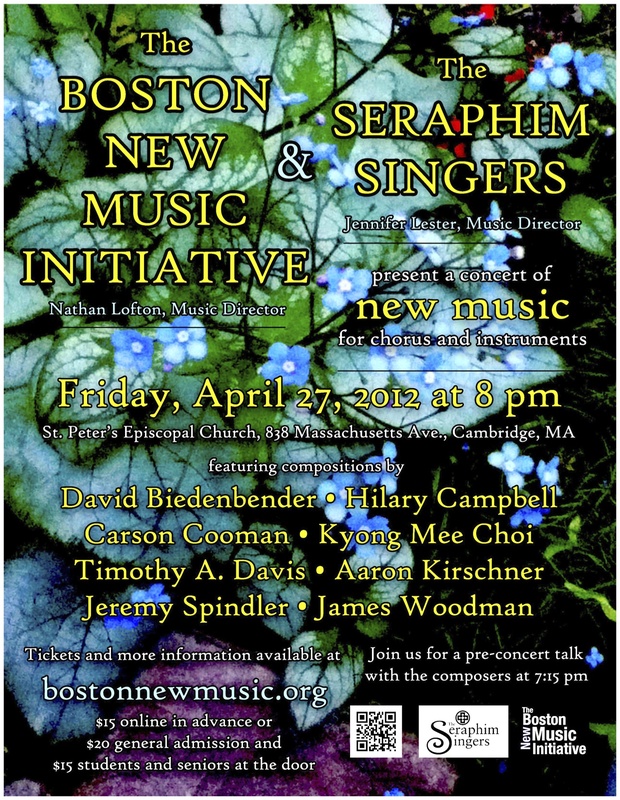 As part of its third concert season, The Boston New Music Initiative will collaborate with The Seraphim Singers to present a concert of choral and instrumental works by living composers on Friday, April 27, 2012 at St. Peter’s Episcopal Church, 838 Massachusetts Avenue, Cambridge, MA. The Seraphim Singers will perform Timothy A. Davis’ Lux Aeterna, David Biedenbender’s Lösch Mir, Hilary Campbell’s plorans ploravit, and Carson Cooman’s Exaltation, conducted by Jennifer Lester, Founder and Music Director of The Seraphim Singers. BNMI will premier Aaron Kirschner’s Forty Winters (featuring Kimberly Soby, soprano) and three movements from Jeremy Spindler’s On 16 Strings. Nathan Lofton, Music Director of BNMI, will conduct Kyong Mee Choi’s Uncarved Water. BNMI and The Seraphim Singers will jointly perform James Woodman’s A Midwife’s Tale. The concert will begin at 8:00 pm with a pre-concert talk with the composers at 7:15 pm. Tickets are $15 online in advance and $20 general / $15 students and seniors at the door; under 18 free. To see the Facebook event for this concert, click here. Please tell your friends, crosspost, and spread the word.